For our initial BC testing we wanted to pick a cartridge that could cover the majority if not all of the practical velocity window competitors utilize in Long Range Competitions like the PRS, many state level clubs, & NALRSA which is basically 2900-3175 fps. We wanted great brass and a capacity that was not too-overbore that when loaded with lighter, slower charges near 2900 fps the reduced load density would still be in the zone for good accuracy . With those criteria one easy shooting cartridge came to mind: 25×284! Just run 6.5×284 brass through a bushing die and you’re ready to roll. We broke in the Rock Creek 5R 1:7.75″ Twist 28″ barrel with Sierra 117 soft points – you could immediately tell the Rock Creek barrel was going to be a hammer with 2-2.5″ 5-shot groups at 500 yds in field conditions (and that was shooting a bullet with a 0.349 G1 / 0.180 G7). When we got back to shop we loaded up Norma 6.5×284 brass with H4831SC and Sellier & Bellot primers. 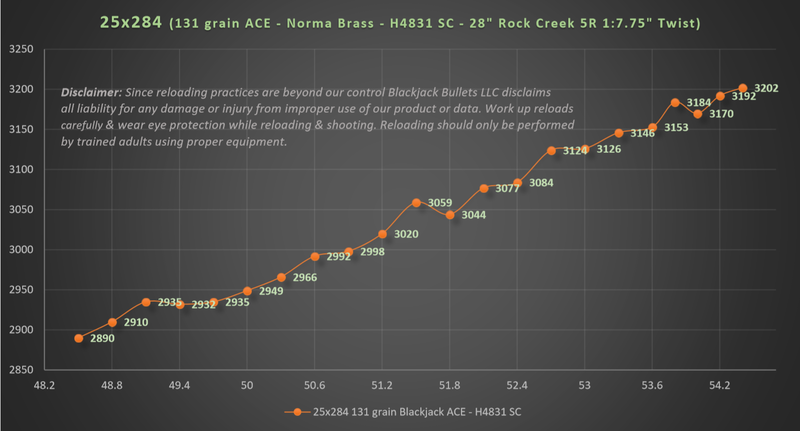 Then we seated 131 Blackjack ACE’s 0.010″ off the lands for the velocity data seen in the graph below as well as the rounds we loaded for BC testing over the Oehler System 88 to compare with our field estimates from earlier shooting. After two days of shooting in afternoon-to-evening and morning-to-afternoon conditions we averaged the 1000 yard results to 0.330 G7 BC for 2930 fps & a slightly higher 0.333 G7 BC for 3140 fps! For any bullet going into a short action magazine and fired from a 308 bolt-face parent case 0.330 G7 BC is impressive – on top of that, this is a 0.257″! The results were slightly better than our estimate of 0.325 G7 but we will continue to publish our results as we test different twist rates like the 1:7″ Twist 3-Groove Lilja’s, the 1:7″ Twist 6-Groove X-Calibers, 1:7.25″ Twist 5R Rock Creeks, 7.25″ Twist 4-Groove Kriegers, & 1:7.25″ Twist 5R Bartlein barrel blanks. If you plan to shoot Long Range Match type cartridges like 25×47 Lapua or 25 Creedmoor 1:7 – 1:7.5″ twist barrels are the preferred setup if you’ll be traveling to different elevations and climates. If you plan on building a magnum like 257 WBY, 25 SAUM, or any of the 25-06, AI’s, or Gibbs variants consider ordering a 1:7.75″ to 1:8″ twist barrel to reduce the likelihood of bullet deformation due to excessive RPMs from the combined twist rate and blistering velocities above 3200 fps. That being said, we saw no issues from the 131 ACE bullets going 3140 fps over extended strings of fire in our 1:7.75″ twist Rock Creek Barrel. Even in switching winds and moderate mirage, the combination proved consistent 1/2 MOA groups on 5 shots and less than 1 MOA at 1000 yds on 10-12 shot strings – all that performance with your average skill level long range shooter (although we had some of the best wind coaches you could ask for!). Soon we will do some extended range testing out to 1320, 1500, & 1760 yds running the Blackjack 131 ACE in the 25×47 Lapua at 2840 fps & the 25 Creedmoor near 2950 fps from 1:7″ Twist X-Caliber Blanks. Stay tuned for more testing and product release dates! We do not yet have a 257 WBY to test in house. Using published load data for 120g bullets and decreasing the starting load by a few grains would be where I would start. As always use caution when working up a load checking closely for pressure signs as you go.